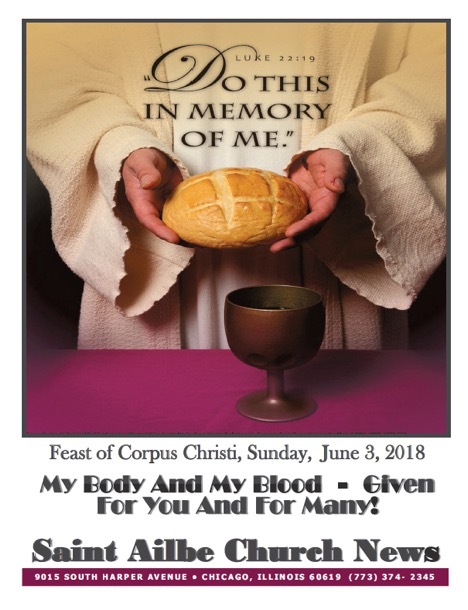 Eat My Body —Given For You; Drink My Blood — Shed For You! What most distinguishes us as Catholic Chris-tians? It is when we gather, week by week, around the Table of the Lord to celebrate the timeless Last Supper Meal! It is not just what we do here in the house of the Lord, but what this meal calls us to do and be all week long. Having been invited to this feast, we celebrate God’s gracious love. We present to the Father the most perfect gift – the Body and Blood of His Son. God graciously shares the gift with us in Communion. We approach the table with profound reverence, awed that despite our unworthiness we are still invited to the feast. We come away with new strength, which gives us hope to face the challenges of life. We leave with inexpressible joy, a joy we are called to carry to our homes, our workplace, our work-place, our world! It is the End of Satan!